Secretary General of the Islamic Jihad, Ramadan Shalah, is urging Palestinian Authority (PA) President Mahmoud Abbas to “pluck up his courage” and cancel out the Oslo agreement, according to the PNN. 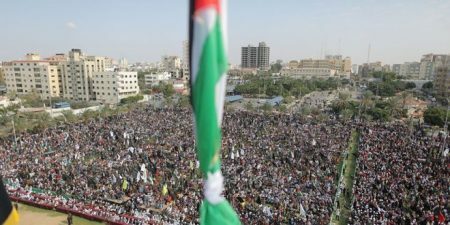 Reaching out to Gaza by phone, during a festival held by the Islamic Jihad, to mark the 29th anniversary of the group’s inception, Shalah urged the Palestine Liberation Organization (PLO) to backtrack on its recognition of Israel. He called on Palestinian President Mahmmoud Abbas to take serious steps in favor of the Palestinian cause and people. The Jihad leader suggested ten tips as a way out from the current impasse emerging on the Palestinian national scene. He spoke up against the tragic upshots of the Oslo accord, proposing that it served as an umbrella to cover Israeli crimes. Shalah stressed the strong bond unifying the Palestinians of the occupied West Bank, Gaza, and the 1948 Territories, calling for healing the rift and working on deactivating the Oslo accord. He stressed the need to restructure the PLO as an organization that is expected to speak up for all the Palestinians alike. According to Shalah, armed resistance is the only way to oust the Israeli occupation. Also speaking during the festival, Hamas leader Mahmoud al-Zahar slammed the Israeli aggressions and break-ins at Al-Aqsa Mosque. He stated that the mosque is for Muslims only. He hailed the Islamic Jihad on the occasion of the 29th commemoration of the group’s founding. “We might disagree over certain matters. However, we are on the same mind as our brothers in the Islamic Jihad regarding our commitment to the key tenets,” said al-Zahar. He added that Palestinian resistance will make no concessions, and will never forfeit a single inch of Palestine. “Palestine extends from river to sea. Palestine is not just Gaza and the West Bank. Our territorial integrity is not a bargaining chip,” al-Zahar further stated. The accords were signed as interim agreements that were to lead towards mutual recognition between Palestine and Israel, including a withdrawal of the Israeli military occupation, a delineation of borders, and Palestinian elections within 5 years. The Palestinian Authority (PA) was formed under the accords as an interim administration for 5 years, until an internationally binding treaty would be signed. Legally speaking, the accords are already invalidated.